Moses Collins was one of the earliest settlers on Bowen's Prairie, appearing in the Wisconsin Census of 1836. Government Land Office surveyors record that by 1837 Moses Collins had established a house and farm at the location of site 13JN196 on an upland hilltop south of today's U.S. Highway 151. By 1853 he had sold all of the land where 13JN196 is located, and the property passed through a series of landowners before the close of the nineteenth century. A structure reportedly stood at the site until 1915. 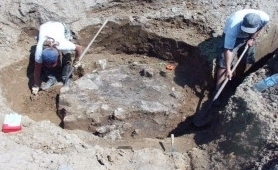 Archaeological investigation of the site, likewise, has produced a layered history of its use through time. Numerous features were encountered including the main living structure consisting of a limestone and soft mud brick foundation with a full basement and an exterior addition that may represent a summer kitchen. It is likely that this larger house was built on top of an earlier cabin represented by a semicircular wall of soft mud brick destroyed by the later construction. Two refuse pits and a large unlined, root cellar were found below and earlier than the level of the proposed summer kitchen. 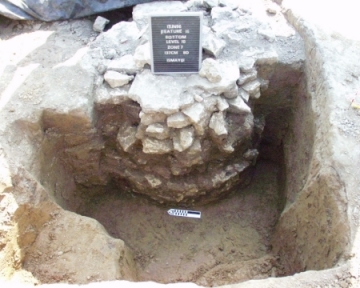 Other discoveries include an unlined privy with stratified fill, a limestone-lined well, a concrete-faced, bell-shaped cistern of limestone, a sheet midden, and other refuse pits. 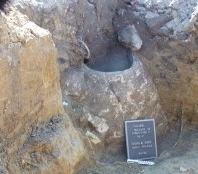 Artifacts from the Moses Collins homestead are numerous and reflect the site's function as a domestic habitation for over fifty years. 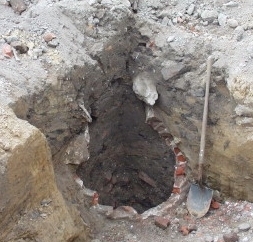 In addition, twentieth-century materials appear to have been dumped into the abandoned foundations and across the site for decades afterwards. While this creates something of a palimpsest of material culture spanning over a century, early items likely associated with the occupancy of the Moses Collins' family do occur. These include hand-painted ceramics, gun parts, gun flints, glass trade beads, and ball clay pipe fragments, as well as a good sampling of food remains in the way of animal bone. The investigation of 13JN196 promises to furnish a wealth of information about the initial settlement of the Iowa Territory and the conditions of homestead life. 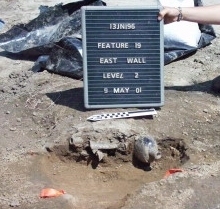 There are few parallels among historic archaeological studies in Iowa.